Maybe you want to capture the world — as it is, or as you want to show it. Whether you’re hoping for a career as a wedding or portrait photographer, commercial and industrial photographer, scientific or fine arts photographer, this concentration within the Bachelor of Fine Arts in Art degree can help you get there. At AUM, you’ll learn everything about being behind the camera — and more — by doing, from 35-mm film to new alternative processes. AUM students have completed internships at Alabama Living magazine, Matter (a design firm), the Stamp Idea Group (an advertising agency), and the Indie Film Lab (one of the three largest photo processing labs in the United States). AUM's Goodwyn Gallery hosts exhibitions by visiting artists and advanced students. Our active AUM Student Art Association organizes trips for students to out-of-town workshops and exhibitions. Employment of media and communication occupations, which includes photography, is projected to grow 4 percent from 2014 to 2024, which will result in about 27,400 new jobs. Demand for media and communication occupations should stem from the need to create, edit, translate, and disseminate information through a variety of different platforms. The median annual wage for media and communication occupations was $52,370 in May 2014, which was higher than the median annual wage for all occupations of $35,540. Trevette Brown was accepted into Atlanta Celebrates Photography's 2016 Portfolio Review, a juried show that provides the opportunity for emerging photographers to have their work reviewed by everyone from a senior photo editor at CNN to the assistant curator of photography at the High Museum to the curator of photography at the Norton Museum of Art. Kaylee Hobbs works as the internet photographer on the marketing team for a luxury and import auto dealer. A survey of the history of photography from its invention in 1839 to the present day. Exploration of conventional 35mm film photography covering both technical and conceptual aspects of the medium as a fine art. Digital techniques associated with negative enlargement will be discussed. Exploration of photographic digital medium involving use of a DSLR and computer based editing. Covers lighting practices associated with portrait and product photography. 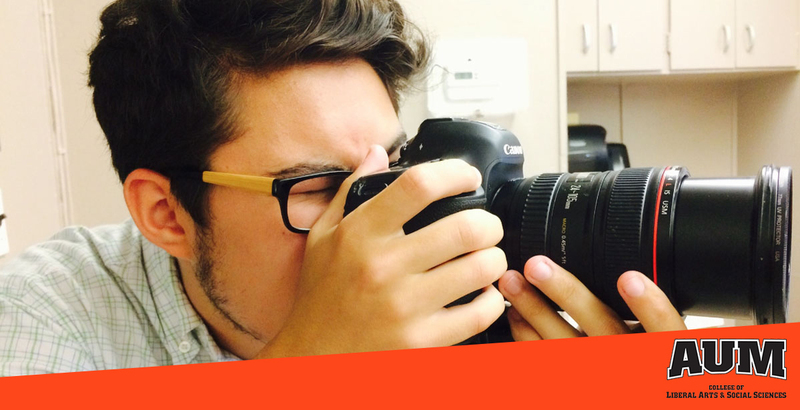 Course expands upon topics discussed in Digital Photography VISU 2812. Students learn advanced digital capture techniques and gain experience with flash equipment both in and out of studio, as well as learn how to work with a model. Exploration of non-silver photographic processes utilizing digital negatives and hand coated emulsions. While many of the processes to be discussed were invented in the 19th century, they will be conceptually approached from a contemporary perspective. A senior project culminating the emphasis under the direction of the student's concentration advisor. The student will make a presentation of their art work for review by the Fine Arts Faculty.